Jealous of those sleeping puppies photos? You’re probably reading this because you have a new puppy that can’t sleep or wakes up throughout the night, which means you are not getting your quota of zzz’s either. If you are a parent of a human child, you probably anticipated the 2 AM feedings, but perhaps you weren’t prepared to deal with a new canine baby that wakes you up in the middle of the night. In this article, we’ll talk about ways you can get your puppy to sleep and stay asleep throughout the night. Most likely your new puppy can’t sleep through the night for one or all of these reasons. When your puppy comes home for the first time, he may be experiencing emotions that are new to him. Away from mom and his litter-mates for the first time, nighttime is likely a lonesome time for him. He is used to sleeping snuggled up to a sibling or two for warm and comfort. Even many adult dogs like to snuggle close to a warm body. If you are crate training, the crate may seem scary or uncomfortable. The events of the day may still linger with him. If this is his first night in the new home, he may be scared, anxious or overly excited making it difficult for anyone to fall asleep, especially a young pup. A full bladder is likely to wake him up and if he is confined to a crate with nowhere to go, he will get distressed very quickly. He may also be hungry. Many new puppies do not eat their first few days very much in a new environment or perhaps he has eaten but his stomach is telling him he should eat again. How do we deal with these emotions and physical causes of sleeplessness without turning night time arousal into a chronic problem? First, let’s deal with the emotions: fear, loneliness and anxiety. Even the most independent minded breeds are going to show signs of loneliness as puppies unless they have been conditioned by the breeder to sleep alone. It is worth inquiring about this possibility if you are still in the process of waiting for your new puppy to come home. Some breeders are willing to crate train for you or, at least, separate the litter in some way, either by crates or even laundry baskets. One breeder, I know purchased six laundry baskets and made beds in each. She then put each puppy to bed in a separate basket. Some of the more adventuresome and strong puppies were able to escape, but the underlying concept made sense. If you are reading this before the puppy arrives, ask the breeder if they will begin to crate time. 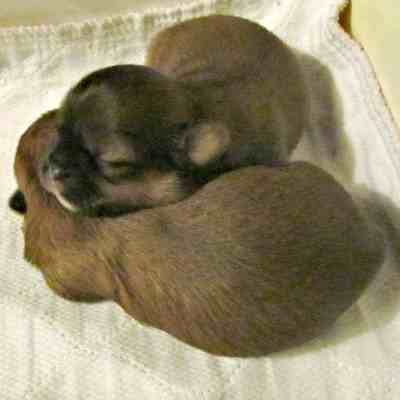 If possible, ask the breeder to give you a blanket that has those familiar “mama and sibling” scents imprinted on it. If not, prepare for the new arrival by getting a crate, a soft dog bed, and a small blanket. While you’re at it, consider a small stuffed toy. If you already have the puppy home with you, consider bringing his crate into your bedroom and putting it near your bed. You can even place it on a chair or low table so the crate is on the same level as the bed. That way the puppy can see you, hear you and you can reach out to touch the puppy while he is in the crate. even a few nights close to you make a lot of difference for future nighttime bliss. If you do not want to do this, the other option is to make up a bed for yourself where you want the crate to be. The idea is to be close to the puppy for the first few nights. Speaking of crates, they need to be comfortable to the new puppy. Some puppies love to sleep on or under a blanket. You can accomplish this natural desire to support their need to touch, by purchasing a dog bed that has soft raised sides and place it inside the crate. If you have already bought a crate with a flat pad, line the edges with rolled up towels to create a bumper of sorts. Add the soft stuffed toy to serve as a pillow or surrogate sibling. If your dog seems to like blankets, throw one in too. Comfort is the key but at the same time, you do not want to overheat. A puppy that is too hot or too cold won’t sleep well. Full bladders are often a likely cause of nighttime stress. 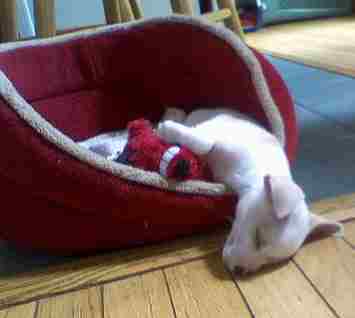 We know from behaviorists that dogs do not like to eliminate in their beds. So the logical thing to do is to cry, whine, bark, howl or vocalize in some way to get a person’s attention. Should you ignore this? The simple answer is no. You do not want to interfere with your good attempts at housebreaking. If you allow the puppy to urinate or defecate in the crate, the whole method of crating can be thrown out the door. What you don’t want to do is create a situation where taking the puppy out to do his business signals to him that it is also time to play. You can accomplish this in a quick way if you get prepared ahead of time. Get a flashlight to place by your bed, your shoes and a coat if needed. If he cries, take him out. Use the flashlight instead of turning on the lights. When you are outside where you want him to go, use the words that you have decided to use for housebreaking (“do your business, hurry up, go pee, go poop”). You can praise him with “Good Dog,” but do not make a big deal out of it as you might during the day. This is not the time for treats either. Pick him up and put him back in the crate. Tell him to go to sleep. Then you lay down and go to bed too. Puppies are very aware of body language so they will learn from you and mimic your actions. Most puppies by the time they are 8 to 12 weeks have developed their night vision and can see well in the dark. You can add a nightlight though so you can observe him and there won’t be any question if he can see you. Some if not most of the middle of night awakening can be reduced and/or eliminated by some suggestions to be carried out during the day. Since all dogs are different, it is important to experiment and find the routine and timings that work the best with your puppy. I hate to mention something so obvious, but many people do not consider this. If you work all day and the puppy is home confined to a small room, pen or crate (hopefully not in a crate all day), they aren’t getting much exercise. How Much Sleep Do Puppies Need? These two sleeping puppies have no problems falling and staying asleep. 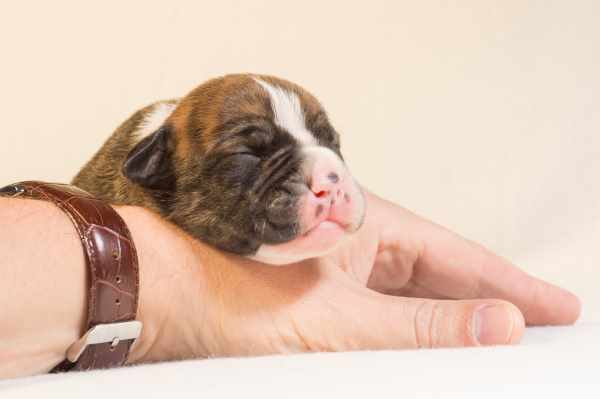 The average 8-week old puppy sleeps on average of 14 to 20 hours per day but most of the sleep time are divided throughout the 24-hour period. They may sleep for an hour or two then play for an hour, eat, eliminate, play some more and then sleep again. As they get older, they sleep less. Consider this good news. If you can direct his sleep patterns early on, then eventually most of his sleep needs will be met at night when you want to sleep. If they are sleeping most of the day, they won’t sleep at night. The more exercise and active play they get throughout the day, the better they will sleep at night. The trick is to push as much of the daytime sleep to the wee hours of the evening. If at all possible, try to keep track of how much time the puppy is sleeping. You might be surprised. A new puppy owner gets home from work at 6 PM. Puppy goes out to do his business then owner and puppy play for a while. Soon it is time for dinner. They eat and then the owner will take the puppy for a walk. By now it is about 8 PM and owner settle down to watch a little TV. Puppy cuddles up and sleeps. At 11 PM, the owner goes to bed, so he takes the puppy out one last time and then puts him in his crate. Sound like a sensible routine that a good puppy owner is establishing? While the owner watches TV, the dog sleeps. When the owner is ready to sleep, the puppy is ready to awaken. Is Two Puppies Better than One? Two puppies might solve the night time problem, but they also add to other problems, so the best advice to you is to get one puppy at a time. Be the puppy’s playmate until they get a little older then consider another dog, if you have your heart set on a two dog household. Is Food and Water the Problem? Food and water are often an issue. When is the best time for dinner? There is no easy answer for this. Obviously the earlier, the better. Your schedule, however, may interfere. Water can be removed early in the evening too but if you like to give him a biscuit before bed, he’s likely to be thirsty so another small drink may be okay. Just don’t allow him to drink an entire bowl of water. A biscuit before bed may not be a bad thing, especially if you have feed the puppy at 5 PM and want to go to sleep at 11 PM. That is a long interval between eating so a small cookie might keep their little stomach full and allow them to rest. You may have already started using these as treats to entice him to go into his crate. Remember to reduce the water intake, but not so much that the puppy is waking because he is thirsty. Will this be the routine throughout his life? Absolutely not. If it does become chronic, consider seeking help from a specialist. Some sleep through the night on the very first day in their new home. Others take a week or two to adjust. Expect a few sleepless nights at first but one morning you will wake up and realize that you didn’t take that middle of the night walk. You may not be home free at this stage, but you’ll be very close. Make the inside of the crate as cozy as possible by adding a dog bed, blanket and soft toy. Feed early, remove water early in the evening. Give a small biscuit or two right before bedtime to curb hunger pains in the middle of the night. Play, exercise, keep puppy active as much as possible during the day and throughout the evening. Take him out if he needs to go but don’t turn it into a play session.